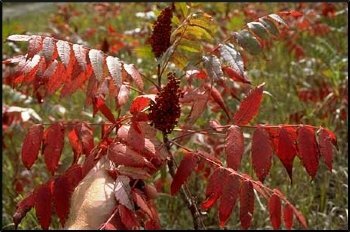 SMOOTH SUMAC - a medium sized, suckering, open shrub reaching 5 to 10 feet in height. The pinnately compound leaves turn an excellent orange to red color in the fall. Best used in wildlife and slope stabilization plantings due to its suckering habit. Native throughout the Midwest and eastern U.S. "